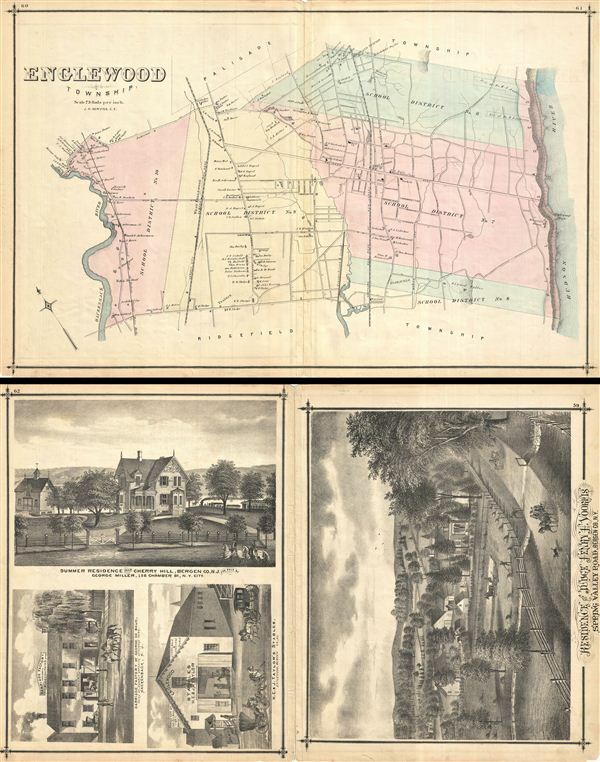 Very detailed 1876 map of Englewood Township, New Jersey, showing roads, property boundaries, and owners' names. Notable too is the early depiction of school district boundaries in a state that today publicizes the high quality of its schools in the context of property values. Published as plates 60-61 in Walker & Pease' exquisite 'topographical, illustrated, historical, descriptive' Atlas of Bergen County, New Jersey, 1876. On verso appear absolutely lovely lithographic views of the residence of Judge Henry H. Voorhis, a house for sale, HE & J Taylor's Stables, Carriage Factory of George de Baun.